Eric Spery is a career Java developer and long time IT manager. He's senior vice president at My Dobot, a San Francisco / Denver based startup developing a mobile finance management tool. The company was founded by three former industry insiders who had seen the wizard behind the curtain, and wanted to create a better way forward – because everyone has the right to financial health. 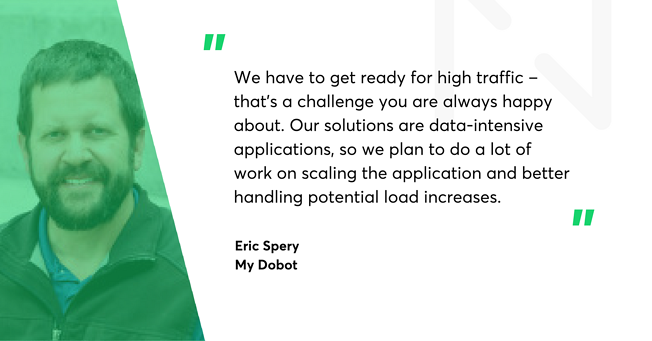 Read the interview in which we asked Eric why they decided to work with remote teams and where My Dobot is now. Bartek Ciszewski: Where is Dobot now? Eric Spery: We're doing great. We started to gain some serious market traction. Now we are having "good problems". We have to get ready for high traffic – that's a challenge you are always happy about. Our solutions are data-intensive applications, so we plan to do a lot of work on scaling the application and better handling potential load increases. Netguru's expertise and development resources have been key in building a number of SMS and MMS solutions for us, as well as seriously fleshing out the infrastructure of the systems we're building right now. Essentially, Netguru is involved in every aspect of our development. Right now we are finishing a project that optimizes a component that will enable the scaling of financial transactions. It handles larger volumes of traffic better. We are also in the process of adding a number of banks to our app. Bartek: Why did you decide to use Ruby on Rails? Eric: To be honest, I inherited it from a previous CTO here – he made the decision. I've been a Java developer since 1996. I know other languages and Ruby on Rails allows us to develop the application very fast. That's the blessing that comes with RoR. As every technology it also has it's downsides. For instance, RoR is not a platform that's designed for multithreading. That is why it is not as efficient in e.g. brute force processing as Java, C# or Python. However, at this stage of our development RoR is just perfect. Later, when necessary, we'll consider a hybrid solution and probably use other technologies for future functionalities. Bartek: Why did you decide to work with remote teams? Eric: My previous job was CTO at a home automation company. The application was built with Java and we worked with a remote team from Poland. They were great. I worked with Indian, Chinese or Russian developers before and it was often a painful experience. Polish developers have superior skills and their English accent is much easier to understand, which makes a large difference when doing remote work, when you have to rely almost exclusively on voice communication. That's why when I moved to my current company, I needed a RoR backend team, and started looking for another Polish company. Eric: I found Netguru out of my search. I looked at seven or eight companies in total, which were offering Ruby on Rails consultation work remotely. I interviewed them, spoke with their developers and eventually settled on Netguru. Bartek: Why did you choose Netguru? Eric: There were a number of factors. Some RoR companies wanted to have additional resources, some did not have developers that were a good fit for us. Netguru offered flexibility, good price, high standards and an impressive developer. I wanted him to report directly to me, so I didn't need a standard "packaged" Netguru offers – with a project manager and a quality assurance specialist included. And it was fine for Netguru. I do work with Netguru's PM, but she's just not in the management team. However, she's very helpful finding substitution for Szymon when he's on vacation, dealing with contracts or hour tracking. As the team gets bigger I can go on and use this resource. Bartek: Do you plan to expand your Netguru team? Eric: Absolutely. I will expand it as our business expands and we're just starting to experience a lift-off, gaining some traction in the industry. Colorado is becoming a tech hub for startups, which creates a tremendous vacuum of good talent. That's definitely a challenge. Netguru takes the burden of job interviews from me. I worked as a VP of Development in a big company for almost 9 years. At some point hiring sucked up 10 hours of my time a week. Netguru are a fantastic team. Szymon, our developer from Netguru, is brilliant. It's a very convenient situation for me. The cost is a bit lower than hiring a local developer, but there are so many advantages. I don't have to go through the hiring process. I can just waltz through a door and find a superb developer. We are working with frontend and mobile developers, but my resource from Netguru is one of the best developers I've ever worked with. I have been a development manager since the early 2000s, but Netguru's developer has stood out as exceptional. Netguru has a large group of senior developers to whom he can go and consult whenever he runs into a problem. We've enjoyed the benefit of this as well. Bartek: As an experienced IT manager do you see companies opening for remote teams? Eric: Yes, it's a trend driven both by new technology and cultural changes. Companies take two approaches to remote teams: they use external resources like Netguru or they have a member of their team working out of office. Both of those scenarios are being made easier by online calls, Slack, Skype, Hangouts, Pivotal Tracker, Github. It's very easy to work remotely now. It also saves company money. Actually there's very little difference between working with Netguru and having your own team working remotely. The Netguru's developer scrums with us, works with us. He's a member of our team. Bartek: Haven't you ever thought a meeting in person would be necessary? Eric: Well, it's not necessary in terms of jobs functionality. On the other hand, I tend to develop good relations with colleagues, and I'd love to meet Szymon in person, just as I'd love to come over and see your country. If we are able to do it, we will definitely arrange a trip to Poland to meet the Netguru team.